This weekend I drove to Hubli along with a friend for a get together of college mates. After we crossed Dharwad I noticed a village girl selling fruits by the side of the highway and stopped to buy a couple of guavas. “How much?” I asked in Hindi. “80 rupees a kilo“, she answered and proceeded to select a bunch of guavas for me. I wanted just two. So I picked a couple and reached for my wallet. The girl looked at me baffled. As I turned to walk towards my car she said, “But brother, this is too much.” I smiled at her and made a hand signal indication that it was ok.
As I started the car, she ran towards my friend who was sitting in the car with me and handed him two apples. We told the girl that there was no need for her to give us the apples. My baffled friend said to her in Hindi, “But I don’t like apples“. To which she replied, “Brother, there are very good apples. You will like them very much.” We figured that she wasn’t going to take no for an answer and we accepted the apples. As we were about to continue our journey, the girl said to me, “Brother, please stop by again on your way back.” We waved our goodbyes to her and as I drove away I kept noticing in the rear view mirror for quite a distance. Her hand was up in the air waving at us till she became part of the horizon. On our way back to Goa we drove slowly at the section of highway looking out for the girl, but maybe we missed her or being a Sunday she wasn’t by the highway that day. 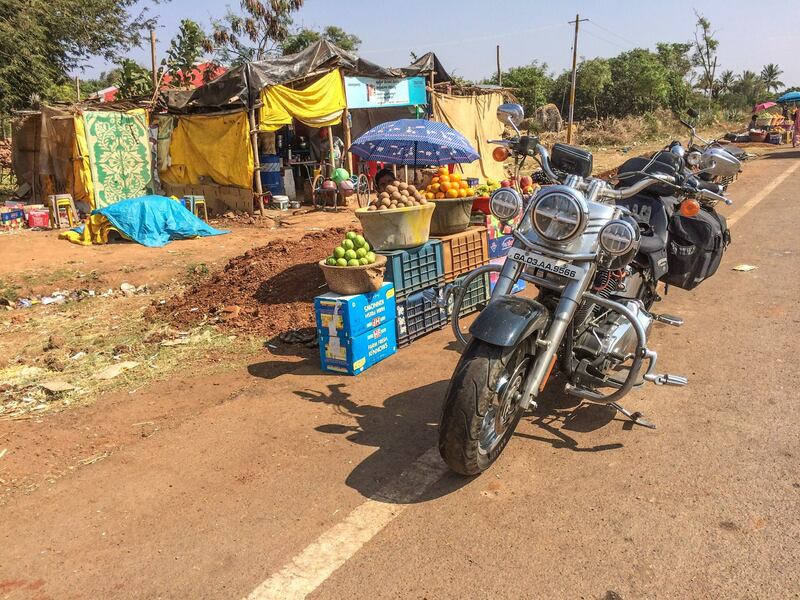 Pic from last year’s ride with my Fat Boy on the same section of highway between Hubli and Dharwad.